I was recently sent a copy of "MALAYSIA - Recipes from a family kitchen", the first cook book to be released by the winner of MasterChef 2014 - Ping Coombes. Drawing inspiration from her mother and from the late-night stalls and street markets in her hometown of Ipoh, Ping has put together over 100 delicious recipes that serve as a perfect introduction to the tastes and textures of Malaysian cooking. Chilli crab and caramel pork, spicy laksas and rendangs, satays and tangy sambals: these classic dishes are intensely satisfying to make, share and devour! 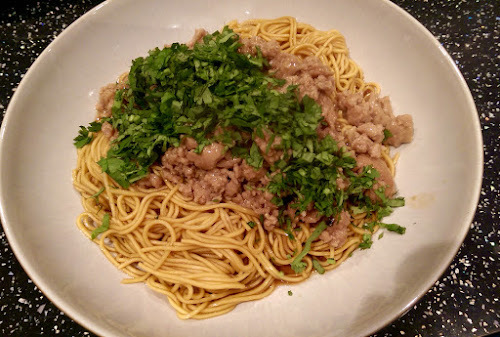 Last night I prepared a dish close to Ping's heart, Hakka Mee, a dish that her mother would make for her to take to school for lunch but Ping would often have the garlicky pork finished before the school bell rang! Pit the mince in a bowl, mix with the marinade ingredients and set aside for at least 15 minutes at room temperature, or longer if you prefer, covered in the fridge. Heat the oil in a wok or frying pan over a medium heat. Add the garlic and fry until fragrant, then add the marinated pork and fry gently (a high heat will dry out th pork), breaking up the mince while it cooks, until it is no longer pink. Add the fish sauce, sweet soy sauce and sugar, then add the 250ml of water. Bring the water to the boil, then lower the heat and simmer gently for 5 minutes. If you think there's too much water, don't worry - so it will thicken and be absorbed by the pork. Dissolve the cornflour in 2 tbsp of water and add it to the pork and bring to the boil. As it boils, the sauce will thicken and coat the pork. At this stage, fold in the coriander and remove the pan from the heat. Cook the noodles for two minutes. Drain well and coat lightly with the garlic oil. Season with the sweet soy sauce and oyster sauce. To serve, divide the noodles into your serving bowls and top with a generous dollop of the pork mixture. To eat, mix it all together and slurp loudly! I was surprised at how good this simple mince and noodle dish tasted. The balance of sweet and salty from the soy was countered by a massive garlic and coriander punch. The Hakka Mee was a little sweeter than I'm used to but I still found it incredibly moreish and myself and Nicola slurped until we could slurp no more. Perhaps next time I make it, I'll reduce the amount of sweet soy that I use and also add a little ginger and chilli to my Hakka Mee for a little extra dimension. 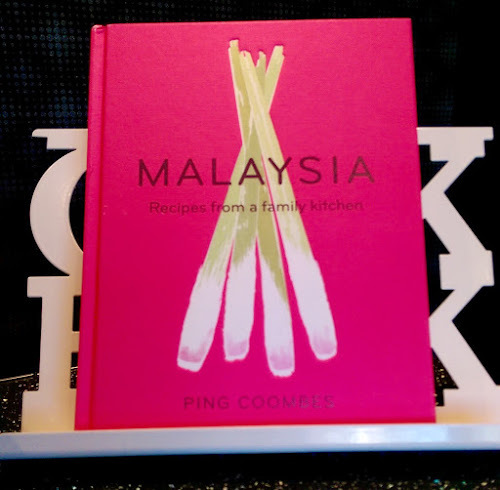 I love the look and feel of the book, the recipes are easy to follow and the photography used in the dishes is stunning and look forward to recreating more of Ping's Malaysian classics. 'MALAYSIA - recipes from a family kitchen' is published by Orion and available from all good bookshops or you can order your copy online at Amazon.